I don't think we can afford to spend much more time here. The wine is so good and we are building quite the collection (albeit a bit focused). We visited three wineries today. First was Cass. 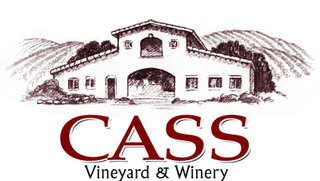 Cass Winery is a family-owned boutique winery specializing in Rhone varietals. We liked so many of their wines that we joined the club and will be getting two shipments per year. They do a very nice food pairing menu with their wine tasting, or a cheese pairing if you want something smaller. Their wine club membership has an option that includes a gourmet food basket and recipe along with your wines. Our second stop was Still Waters Vineyard. 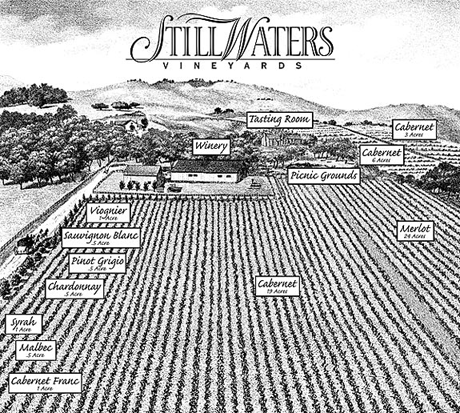 Still Waters has a gorgeous location…60 acres producing fourteen varieties of premium Central Coast grapes. Also located on the vineyard is a 100 year-old olive orchard that yields a mixture of Mission, Sevillano and Ascolano olives, pressed using an Italian mill that combines the best of traditional and modern methods. 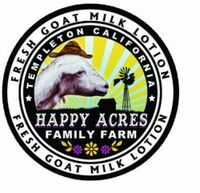 (Of course we added some olive oil to our purchase, along with some great lotion made from goats' milk from Happy Acres Family Farm. Our third and last winery of the day was Pear Valley Vineyards. Another gorgeous location, family owned, with 100% estate-grown wine. All in all a very nice day. So far we've only been to wineries on the east side (east of 101) and we've gotten some tips that the super big wines are on the west side, so tomorrow we'll head over to two more wineries, try not to bring home TOO much more, and perhaps visit an olive farm and bring back some olives as well.